Min Lee made her debut with the Singapore Symphony Orchestra when she was 12 at the inaugural President’s Young Performers Concert. 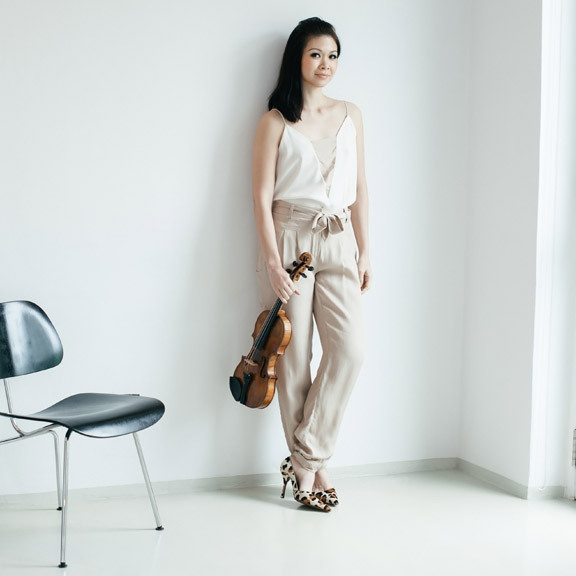 At 14, Min Lee became the youngest student to be admitted for graduate studies at the Yale University, where she was schooled by the late, eminent violinist Erick Friedman, himself a protégé of the legendary violinists Jascha Heifetz and Nathan Milstein. Both Heifetz and Milstein were the protégés of the legendary Russian violinist and pedagogue, Leopold Auer. Min Lee graduated in 2000 at 17 and in that same year, she made her London debut at the Wigmore Hall followed by performances at the Royal Festival Hall with the Royal Philharmonic Orchestra. Since then, Min Lee has appeared in concerts with orchestras including the Philharmonia Orchestra, Royal Philharmonic Orchestra, Vienna Chamber Orchestra, Prague Chamber Orchestra, the NHK, San Diego Symphony and the Russian National Orchestra among many others, under the baton of prominent conductors such as Charles Dutoit, Vladimir Ashkenazy, Peter Oundjian, Jahja Ling and Mikhail Pletnev. Min Lee has released two albums under Universal Music Group, Debut and a CD comprising Tchaikovsky’s Violin Concerto in D and Prokofiev’s Violin Concerto No. 2 with the Royal Philharmonic Orchestra under Vladimir Ashkenazy. A prolific fundraiser and youth ambassador for her favourite charities, Min Lee has raised some $6 million has over the years to benefit various charitable organizations, including the Princess Diana Aids Benefit, Red Cross Society in Hong Kong, Children with Renal Failure in China, the NAFA fund, Viva Foundation for Sick Kids and The Business Times Budding Artists Fund. In 2007, Min enrolled at the Lee Kuan Yew School of Public Policy and graduated in 2010 with a Masters in Public Policy. Min Lee is now happily married to Mr Loh Lik Peng, and they have two children – six-year-old Conor and two-year-old Cassidy. Through her performances, Min has helped to raise more that $5 million for charitable organizations such as the International Action for Aids, the Hong Kong Red Cross Society, NAC Gifted Young Musicians, and the Presidential Charities. Recently, she raised $250,000 in Shanghai for the Children with Renal Failure and through her performances with the Philharmonia Orchestra and Vladimir Ashkenazy, she raised $200,000 for the Nanyang Academy of Fine Arts in Singapore .